The new aquastream XT pump is the completely redesigned successor to the well-proven aquastream Rev. 3.5. It presents the absolute peak of development of practically silent pumps for water cooling systems. But this pump is not only a pump, it is also a highly integrated microprocessor-controlled measuring- and control system for your cooling system. This truly unique system was even improved over the preceding system, greatly increasing the functionality of the unit. All version of the aquastream XT have an USB interface, allowing monitoring and control of the unit even without connection to an aquaero. The control functions are accessible via the popular and free Windows-software aquasuite. Depending on the unlocked software version of the pump additional features such as a fan output, temperature sensors as well as a connection possibility for a temperature sensor. In the maximum equipped version all important monitoring and control functionality for your water cooling system is already integrated in the pump. The new features include turning detection as well as automatic maximum frequency measuring, ensuring reliable operation even at maximum power. In comparison the the previous versions of the aquastream XT the control unit was integrated into the pump's casing without having to enlarge the unit. 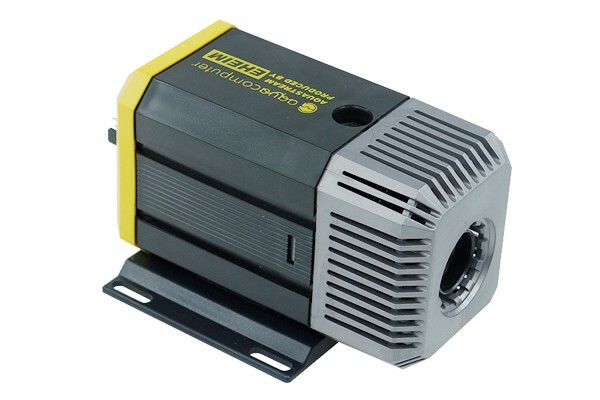 The mechanics of the pump are based on the proved Eheim technology with yet to be matched smooth operation. Compared to the predecessors the pressure head was increased to sensational 4.2m. This means that the aquastream is one of the most powerful pumps on the market whilst still being almost completely silent. This was achieved with a highly intelligent control system with complex algorithms and sensors. Permanently and more than 1000 times per second the rotor position, current draw, power and voltage are monitored. From this data the perfect settings are computed, allowing the pump to run with up to 6000rpm internally, depending on the system. The pump frequency is automatically set by the pump or can be set manually via the software. The pump finds the optimal operating point by itself. The data is additionally passed on via USB or aquabus and can be read out and displayed in the aquasuite software. The aquasuite software is a system for all aquacomputer products which needs to be installed only once and offers an integrated database, network capability (maintenance also) and many control features. Parallelly a rpm signal can be passed on to the Mainboard which allows an emergency shutdown if the pump fails. Of course the aquastream XT is also equipped with the handy deaeration program which was introduced by Aqua computer years ago. This program can be started via a jumper or via the software. The program can even be configured to your own preferences. No other competing product can offer the range of functionality and performance of the aquastream XT. Our R&D department has already integrated a sensor for measuring of the water temperature into the pump. The data from this sensor can be read via aquabus or the aquaero and used for adjustments. Additionally multiple temperatures are monitored in the power amplifier section. The pump has an intelligent protective system. If the temperature rises above the pre-programmed safety setting, the electronics are set into a safety mode to prevent damage. Depending on the temperature different strategies are used. External connective possibilities expand the performance spectrum: An additional external temperature sensor and a flow sensor can be connected directly to the pump. Both are monitored with extremely high precision and can be integrated into the alarm settings. An unbelievable number of alarm settings and parameters can be set. You wish to have a high-performance cooling system with one of the best controlling mechanisms in the world? Then the aquastream XT is the perfect solution for you! The integrated highly complex PID controllers work in the microprocessor to achieve only one goal: To keep your system at the temperature you want and to keep it as quiet as possible! This is achieved with a mathematical model which calculates the fan speed settings and monitors the current speed more than 1000 times per second. Of course without the annoying noise from PWM a highly precise analogue voltage is put out. The starting voltage of your fan is also taken into account and automatically set by the controller. You wish to have more control? Take it! All controller settings can be influenced by you in detail or can be set comfortably with pre-sets. The speeds can be adjusted following the internally measured water temperature, the external temperature or following manual settings. Of course an alarm signal is given when the fan fails. By the way: it is no problem to connect 3 airstream fans to the fan output. This means that even 360mm radiators can be controlled without problems. Buy all features now - or when you really need it? The pressure and inlet connections are identical with the Eheim 1046 pump. The adaptor kit and suitable fittings have to be purchased separately. IMPORTANT: If you wish to install this pump in an aquabay, you will need a current connection kit and a current aquabay. Old version from before September 2007 are not compatible! In our support section a current version of the aquasuite software can be downloaded for free and used in demo mode. In this mode the menus and displays of an aquastream XT can be seen without a pump. Should the product be shiped with an "origninal Aquacomputer quality seal" we wish to inform you that this seal often detaches itself. A detached quality seal is no justified reason for reclamation. The pump can be severely damaged if the USB connector is connected with wrong polarity. Such damages are covered by the warranty, Aquacomputer does not replace pumps which were destroyed by such mistakes! We at Aquatuning are not able to inspect the pump and hence only forward it to Aqua Computer. the delay by this process can be eliminated if you send the pump to the manufacturer directly. Note: A cable for connection of the aquastream pump with the aquaero is included with the pump. 1. Können mit der Software für die Pumpe auch 2 Pumpen für 2 Kühlkreisläufe separat gesteuert werden ? Dazu Bitte an den Hersteller wenden.